A rhythm Pollak has dubbed 'Rumbatap' is essentially his using his entire body as an instrument. As he soloed, the whole band visibly focused in as one. 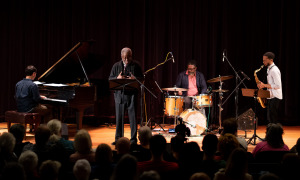 Jazz musicians are, in general these days, academics. Formal jazz education is more popular than ever. Some would argue that this training has "mainstreamed" the music as most jazzers are learning the same things in school. Perhaps such detractors need to focus more on the breadth and diversity that has been brought under the jazz umbrella in recent years. But that is an argument for another time. 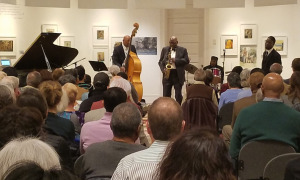 What the increase in jazz education has spawned, inarguably, is the inability of many artists (or, more pointedly, the unwillingness) to simply "let it all fly," to throw learning out the window and embrace the now. It is for this reason that seeing and hearing Grupo Los Santos at the Jazz Standard was so refreshing. Admittedly, this is a group of young academics. You could see it in the crowd (which included parents and student friends), and you couldn't help but take notice when drummer William "Beaver Bausch gave a lesson on the beats of a rumba. But the raw energy with which the band played was anything but sterile or "academic." 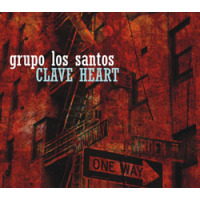 Grupo Los Santos, which is composed of Paul Carlon (saxophone), Pete Smith (guitar), David Ambrosio (bass), Max Pollak (percussion and rumbatap), and Bausch, plays predominantly Latin music, including rumba, son, and bossa nova. The musicians come from varying backgrounds, but they obviously have a deep connection. From the get-go, they were smiling and loudly approving of each other's playing. The first tune was pretty laid back, with Bausch beaming as first Carlon and then Smith took solo turns. Suggesting a combination of John Scofield and Kurt Rosenwinkel, Smith wears his emotions on his sleeve, and you can see the twists and turns of the music as his facial expressions change. He also has a habit of scatting along with the notes that he plays which, as with Rosenwinkel, only adds to the dramatic effect of his guitar playing. 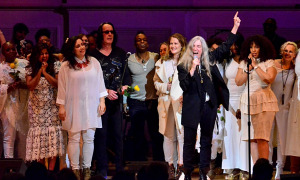 The group invited Pollak to the stage for the second tune, and the energy in the room immediately intensified. 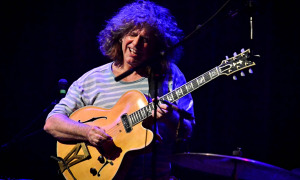 A rhythm Pollak has dubbed "Rumbatap is essentially his using his entire body as an instrument. Tap dancing is but one part of the equation: chest, arms, knees, and hands all play an integral role. Not only did the percussionist supply added power to the rhythm section, but his solo space provided some of the most spellbinding moments of the evening. Even while soloing over Bausch's and Smith's accompaniment, he maintained a mean groove. And as he soloed, the whole band visibly focused in as one. In sports, it's known as being "in the zone. Smith was wide-eyed while comping to the groove, while Bausch's big smile and Ambrosio's complete concentration betrayed their emotions. Bassist Ambrosio throughout the night was simply the rock of the group. In this band Bausch is often adding color and not simply keeping time, and so the timekeeping responsibilities fall heavily on Ambrosio. 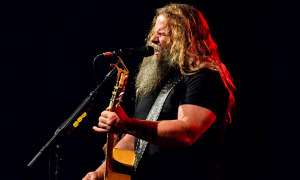 For his efforts he was rewarded with some extended solo space on the third tune, and took full advantage of the opportunity. 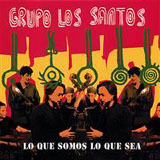 Grupo Los Santos possesses many of the qualities that define some of the best ensembles, including unspoken communication and plain unadulterated fun. 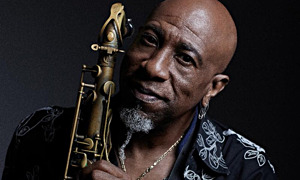 While each musician may not as yet be at the very top level of musicianship, the whole in this case is certainly greater than the sum of its parts. This is still a young band; as the musicians mature, the group will almost certainly develop into a force to be reckoned with. In the meantime, it offers a refreshing take on what music should really be all about.